Friday August 17th – With the sunshine we’ve got on the track right now and the promising forecast for the afternoon/evening, it looks like we might actually get a Friday Frenzy in tonight! Gates open at 5pm, track hot by 6pm and we keep it hot til 11pm, $15 at the gate for crew/spectators, $25 for drivers, kids 12 & under free! 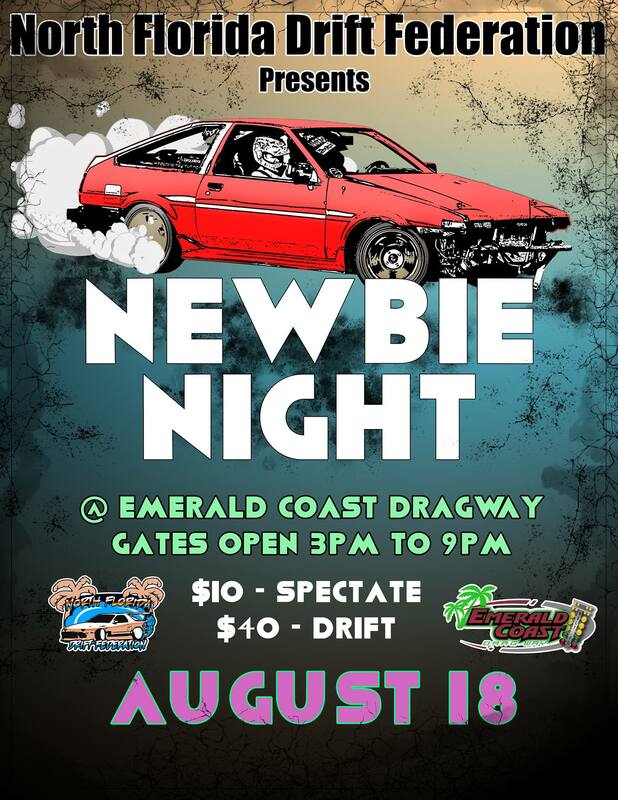 Saturday August 18th – “Newbie Night” presented by the North Florida Drift Federation, come watch (or participate!) in some drifting action through our pit area Saturday afternoon and into the evening. If you’ve ever wanted to see what it’s like to drift or work with some experienced guys to show you the ropes with your car and what you need to do, tonight is your night! Gates open at 3pm and we run to 9pm, Crew/Spectators are $10 at the gate, $40 if you’re planning on whipping your hot rod around the drift course, kids 12 & under free!